As with everything in this life, we can look at Spring in two ways. I love writer Dorothy Parker’s take on the season. “Every year, back come Spring, with nasty little birds yapping their fool heads off and the ground all mucked up with plants.” I’m going to bet, however, that since you’re reading Reunions magazine and are probably knee-deep in planning one amazing get-together, that makes you an optimist – the human personification of spring (Susan J. Bissonette). Spring is ripe with new life, pleasant temperatures and, let’s be honest, off-season rates for reunions of all varieties. 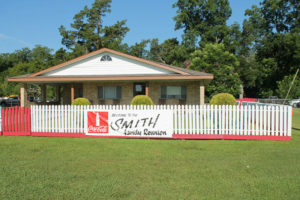 Site of the Smith Family Reunion picnic in Garland, Louisiana. downtown. Indoor and outdoor landscapes are embellished with more than 60 sculptures such as bronze meerkats, a coyote in the arid garden or a mother and baby bear on a nature trail walk through wetlands and woodlands. The Gardens boast the Western Hemisphere’s largest “Leonardo da Vinci’s Horse” sculpture, a magnificent 24-foot-tall objet d’art. “Foremosts’ Butterflies Are Blooming,” the largest temporary butterfly exhibit in the nation, graces the Gardens from March 1 through April 30, 2001. You may consider Sunday Brunch at the Gardens for a reasonable $14.95 for adults, $6.95 for five to 12 year-olds and $3.50 for four and under (616-957-1580). Sally Littlefair, Marketing Director said, “I can’t think of a better place than the Frederik Meijer Gardens for a reunion that offers gardens, spring flowers and sculpture for the party to enjoy. Our new expansion includes an 850 seat meeting space, gift shops and sculpture galleries. When a party rents space (from 30 to 850), the facility extends the rest of the public spaces for view. Reunions of 30 to 40, can rent and enjoy a garden setting, in special rooms, like the Victorian Garden Parlor and Seasonal Display Greenhouse. Just for fun, try Pal’s Diner, an authentic 1954 structure in all its pink and silver glory. Current owners discovered Pal’s in New Jersey and moved the beautiful beast intact to Grand Rapids. Pal’s seats 50 for hand-dipped shakes and malts, egg creams and phosphates at the fountain; classic dinner sandwiches and Mom’s meat loaf and bread pudding that’s made from scratch (6503 28th St. SE; 616-942-7257). The 103rd Infantry chose the Crowne Plaza in Grand Rapids. Willis Gavitt, son-in-law of Infantry member Harvey Ellsworth who passed away six years ago, said this might indeed be the last of reunions originating 36 years ago. “This division which General Patton commanded in Europe, had its first reunion in Michigan and it will wind up in Michigan” he explained. At last count, this year’s group should number between 400-500. Why Grand Rapids? “Grand Rapids offered the best package deal for us,” Gavitt laughed. Some of the men, women and spouses have a golf outing and others take bus trips to different attractions. “We always have a big banquet on Saturday night and sometimes have a speaker,” Gavitt said, mentioning a French general who spoke to the group about Europe’s liberation. In addition to the annual gathering, some of the Infantry members travel to Arlington National Cemetery to place a wreath on the tomb of the Unknown Soldier. Grand Rapids’ Holiday Inn East recently hosted members of the USS Hunt, checking in at 130 alumni. 500 members of the 3rd Armored Division are expected to storm the Amway Hotel in 2002. The Michigan Military Air, Land and Sea Museum breaks ground this spring near the entrance to Gerald R. Ford International Airport in Grand Rapids. The museum will be both a historical and educational facility with exhibits, seminars, workshops and lectures providing future generations an opportunity to learn about how our country’s freedoms have been won and maintained. Some of your group may choose to wander Grand Rapids’ Van Andel Museum Center, an interactive history and science treasury located downtown on the Grand River. Marvel at the 75-foot Finback Whale skeleton hanging from the ceiling or take advantage of Kodak moments on the 1928 carousel that extends over the water. Astro-nuts will want to visit the Roger B. Chaffee Planetarium and others delight in the permanent exhibit that features 500 pieces from the museum’s doll collection. “The Furniture City” is an expansive exhibit of the some of the styles and pieces that made Grand Rapids known worldwide as a leader in the production of fine furniture (616-456-3977). Grand Rapids downtown has experienced a renaissance recently with $200 million tapped into cultural, recreational and sports facilities. The Grand Rapids Children’s Museum, geared to two to 10 year olds has plenty of interactive displays and seasonal programs (616-235-4726). While family members with youngsters are enjoying the Children’s Museum, art lovers can walk two blocks to the Grand Rapids Art Museum, home to more than 6,000 works of art (616-831-1000). Hometown prez, Gerald Ford, has his own museum that contains surprisingly interesting artifacts and exhibits. Exhibits allow visitors to attend a White House State Dinner, eavesdrop on the Oval Office, stand on the floor of the 1976 Republican National Convention and return to a 1970s disco. A ride to Veldheer Tulip Gardens & De Klompen Wooden Shoe & Delft Factory in Holland, Michigan (616-399-1900) makes a unique day trip. The US’ only Delft Factory making Dutch pottery and Holland’s finest Wooden Shoe Factory also boasts America’s largest commercial tulip garden. Factory tours are free! Holland’s Dutch Village has attractions for all ages; Dutch folk dancing, wooden shoe carving, movies, museums, rides for kids and specialty shops featuring imported gifts (616-396-1475). The park is open late April to early October but Queen’s Inn Restaurant and gift shops are open year round. Golfers’ tees get all atwitter at the prospect of choosing a course in Grand Rapids that ranks high in number of public courses-to-population with new courses added every year. If golf is a reunion focus, you may opt for a West Michigan Golf Getaway package, with tee times prearranged by participating hotels. Contact the Grand Rapids/Kent County Convention and Visitors Bureau (800-678-9859); www.visitgrandrapids.org for details. If flowers set your heart aflutter, how does a 14,000-acre botanical display garden and resort located in the foothills of the Appalachians riffle your roses? Located in Pine Mountain, Georgia, an hour southwest of Atlanta, Callaway Gardens has welcomed families for over 40 years with southern hospitality and wholesome activities. Warm mineral springs have attracted thousands seeking healing, including Franklin Delano Roosevelt. Then, visit the grounds and interior of FDR’s “Little White House” in nearby Warm Springs, Georgia. Callaway Gardens is a horticultural haven for gardeners and nature nuts. Want to get the scoop on sunflowers, herb and vegetable gardens and perennials? Free programs at the Sibley Horticultural Center raise your rhododendron to new heights. Georgia’s largest park, FDR State Park, borders Callaway Gardens for hiking and horseback riding. Hunt for antiques in Warm Springs or the town of Pine Mountain. A 30 minute drive to Columbus offers military museums, a fine art museum and southern restaurants featuring Brunswick stew, collard greens, pulled pork and tart barbecue slaw. Since 1986 Dr. W.D. Moorer’s clan, now numbering 81, has chosen Callaway Gardens every other year except one and the family unanimously decided to return after that detour. “The people at Callaway are very cooperative,” he explained in an easy Alabama drawl. “We have our little routine and they help us plan it. For example, we always picnic on Friday night in the garden. 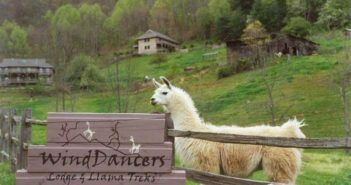 We meet at dusk for drinks and a good picnic supper.” On Saturday, the Moorers disperse; some play golf, others take advantage of terrific tennis programs and naturalists tour the gardens. Of course, there’s plenty of action for children including the “Flying High” Circus from Florida State University. “We have a photograph session in the courtyard late in the afternoon,” Dr. Moorer continued, “then cocktails and dinner. We reminisce and tell old stories about father and mother and how they came up the hard way, suffered in the depression and raised three sons who served in WWII. There are three admirals in our family,” the good Dr. beamed. Dr. Moorer finds Callaway convenient for members who fly from around the country, with Atlanta just an hour away. Cottages feature a living/dining area, fireplace, fully equipped kitchen, screened porch, color TV and private bath with each bedroom. Two, three and four-bedroom villas are another possibility. Contact Callaway Gardens at 800-225-5292 or visit www.callawaygardens.com. Reunions mean revisiting the past, so why not go all out and blast back to 18th century America at Colonial Williamsburg, Virginia? Colonial Williamsburg offers a daily dose of special attractions, events and tours along famous Duke of Gloucester Street in the Historic area. The fact that many buildings are original or restored and the British did not send air conditioning to its colonies is another vote for spring reunion. Some members may choose to experience the “Raleigh Tavern Evening” where you interact with the typical 18th century townsfolk and travelers. The Raleigh Tavern was a magnet for politicians, students, intellectuals and gamblers in the Colonial Period (800-HISTORY for program reservations). 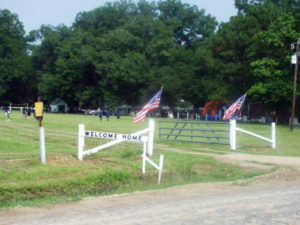 Nearby attractions include “Carter’s Grove,” on the James River, where you can walk through an outdoor reconstruction of slave quarters and King Carter’s plantation home with period furnishings as well as the “refusal room.” Allegedly, Washington and Jefferson proposed marriage to young Colonial ladies in the drawing room and both were refused. Art aficionados will want to tour the DeWitt Wallace Gallery, an outstanding collection of English and American antiques. While there are plenty of budget and mid-priced motels in and around Williamsburg, lodging at one of the “official resort hotels” offers advantages such as free shuttle bus service (which precludes driving during your stay), free package delivery to your room, special programs for children and more. Because there is a wide range of rates, from the inexpensive Governor’s Inn to the stately Williamsburg Inn, choosing one of the “official” hotels is an intelligent choice for reunions. Permutations of packages are extensive depending upon the length of your stay, month, number of members, etc. Call 800-822-9127 to ask about special 2001 group rates. Day trips include the theme park Busch Gardens Williamsburg, a short drive from the Historic area, Atlantic Ocean beaches, Jamestown Settlement, Yorktown and tons of outlet stores for shopping. Journalist/Editor Jacky Runice has penned a weekly travel column for Chicago’s Daily Herald since 1994 and writes about travel and dining for USAToday.com; CBS Local Chicago; and Examiner.com. She expands her repertoire at Kane, Lake and McHenry County (IL) Magazines with articles about everything from healthy living to technology. A former Chicago radio talk show host, Jacky has three grown children who have inherited her love of sampling new cultures, countries and cuisine.